Your troop may already be up and running, but that doesn’t mean it’s too late to welcome new members! Adding new girls to your troop—even midyear—can help energize your group, showcase the Girl Scout spirit of sisterhood and inclusion, and demonstrate by example how Girl Scouts is the best leadership development experience for girls in the world. Period. After all, Girl Scouts is all about trying new things, building new skills, and getting to know new friends in a safe and supportive all-girl environment—with guidance from caring troop leaders like you, of course! To smooth the transition for your newbies, incorporate these fun activities into your meetings, and new girls will feel at home in no time at all! 1. Set up a storytelling meet-and-greet! One of the absolute best ways to connect with others is by swapping stories. Introduce newcomers at their first meeting, then have everyone else introduce themselves, covering the basics, like their first name, age, and years in Girl Scouts. Encourage your seasoned Girl Scouts to go a little more in-depth by sharing something about their families, pets, or interests. Maybe each girl can pick three things about herself she’d like her new Girl Scout sisters to know. Once all troop members have introduced themselves, ask new girls to share some of their own stories. Be sure to build in time for questions so the girls have even more opportunities to connect and share. Make it super interactive and fun by finishing up the meeting with a cool trivia game to see how much they remember about one another! 2. Showcase what your troop loves to do most! At a new girl’s first or second meeting, work with the other girls to plan an activity around things the troop loves to do most, whether that be community service, outdoor adventure, photography, or science experiments. What better way to get a new Girl Scout’s experience off to an exciting and memorable start than to head straight into the action? At the beginning of the meeting, have a couple girls take the lead and explain the activity and why they love it so much. 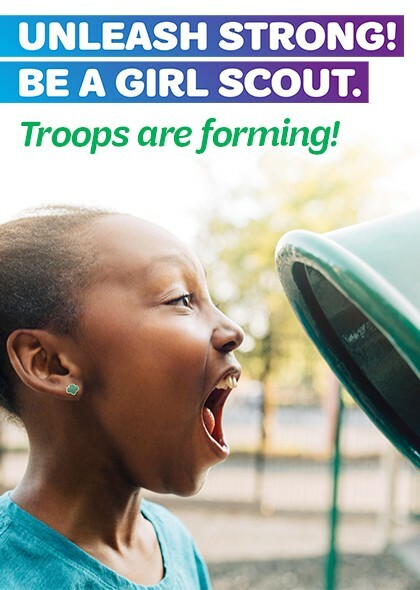 For subsequent meetings, give new girls the opportunity to choose activities they love most and help them plan something special to share with the troop! 3. Encourage her to take the lead! Girl Scouting is all about taking the lead and making things happen, so let newcomers do so early and often. You can start small, having them lead a simple activity, or go big by encouraging them to teach their Girl Scout sisters about an issue that really matters to them. You might also go around the room and have everyone share what taking the lead like a Girl Scout means to them, complete with real-life examples to help new girls really get a grasp of leadership and everything they have the power to accomplish as Girl Scouts. Allow them time to ask questions, too. Learning and leading, that’s how we Girl Scouts do it! This entry was posted in General, Membership, Volunteers and tagged Be a Girl Scout, Girl Scouts, Girls, GSCI, Join, Take The Lead, Unleash Strong. Bookmark the permalink.